Meet Deborah Kelson, a marketing executive in Silicon Valley and mother of two adorable kids, who always had a dream—to make a children’s book about taking turns called Peanut Butter or Jelly. In order to make this dream come true, she created a Kickstarter campaign and joined forces with Blurb to seamlessly make it all happen. She used our free desktop publishing software to perfect the layout and took advantage of our volume order and did an offset run to keep her costs down. Because she’s awesome, she put together an amazing page of Kickstarter Best Practices that we think are must-read for anyone thinking of putting together a Kickstarter campaign—before you start your campaign. We think she’s a great inspiration since she made her book and left her mark. How did your project begin? I wrote the original manuscript for Peanut Butter or Jelly about a decade ago while living in New York. I was taking a class on writing and illustrating children’s books through NYU and came up with the idea. After the class was over, the manuscript sat untouched for years. Fast forward five years and I have two kids, and we read together every night. After reading dozens of creative, smart, clever books—and dozens of uninspiring, repetitive, boring books—I thought I had something good on my hands. I decided to take a break from work to finish what I started. What was the purpose of the project? What did you want to do with the book? When I decided to publish Peanut Butter or Jelly, the goal was to make it exist. I decided to self-publish to make sure that it saw the light of day rather than the bottom of a slush pile. As author and illustrator, retaining creative control was also important to me. I didn’t want a publisher to love the story OR the photographs. I wanted to be responsible for the whole shebang. What made you use Kickstarter? I worked with the good folks at Blurb to set up a bulk printing for the book. The cost per unit was reasonable, but it was a significant cash outlay (about $12K). I used Kickstarter to drive pre-orders to fund the bulk printing and distribute financial risk. What was it like to set up and run a Kickstarter campaign? I had no idea the Kickstarter campaign was going to be the most rewarding part of the self-publishing process. After months of writing and rewriting the manuscript, taking hundreds of photographs, and perfecting the layout, I felt fulfilled. But then I launched the Kickstarter campaign and the experience was magical. Kickstarter provided the ideal platform to reach out to everyone I ever knew to ask for their pledge. I am still humbled by the generosity of friends and strangers. I wrote a blog post about Kickstarter best practices in the hope of inspiring other creators. It was like a dream. 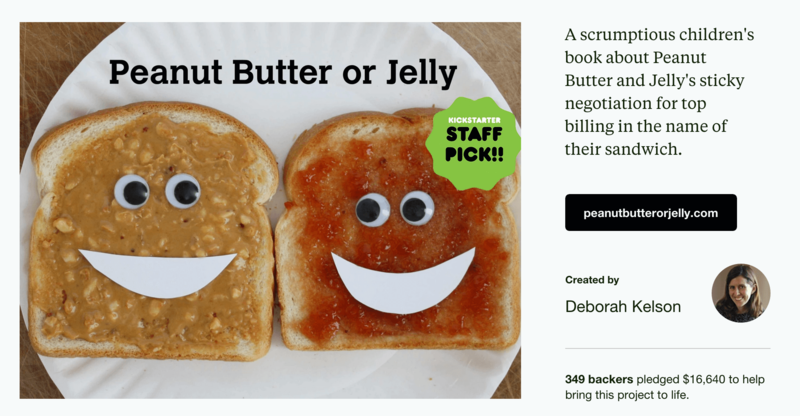 Peanut Butter or Jelly was selected as a Kickstarter Staff Pick within an hour. I was fully funded in 10 days. I beat my fundraising goal by 39%. And I reconnected with friends I hadn’t heard from in years. How did you find Blurb? Good old fashioned Google search. What made you decide to go with Blurb? The design software. I was ready to teach myself inDesign but didn’t have to because of BookWright. I also thought that pricing was competitive, especially given the quality of the books. How long did it take you to complete your project? It depends on when you define the start/end date! I would say I spent about four months from first rewrite to ready for production. Was there anything that surprised you about the project? The outpouring of support from people I barely knew. Allow more time for fulfillment! How did you promote the book? During the Kickstarter campaign, I relied on email and social media. After Kickstarter was complete and I had the book on hand, I launched a dedicated website (www.peanutbutterorjelly.com), joined Amazon’s Advantage Program to sell the book online, and canvassed neighborhood bookstores in San Francisco. I’ve also done a series of readings at schools. Was distributing the book to places like Amazon something that you wanted to do? Amazon was gravy. I just wanted to see the book on my friends’ kids’ bookshelves. Do you have another book project that you’re thinking of making? I have three other drafts in the works. I just need to find the time to complete them. I would love to have the experience working with a publisher so I can weigh the pros/cons of traditional publishing versus self-publishing. I certainly wouldn’t mind relinquishing the envelope stuffing to someone else. I love this story. It’s great and inspirational. Couldn’t she just have designed the book and posted it on Blurb to sell without all the crazy fulfillment and envelope stuffing as well as cost? Thanks for the question! She certainly could have, but buy raising money up front she was able to get the book offset-printed (as opposed to one-at-a-time), which brought the cost per-book way down. Right…but don’t you print the book AFTER the Kickstarter campaign, so the fulfillment could still be through Blurb? I’m confused…. We now have an option that lets us warehouse books and then ship them to a list provided to us by the author, which certainly makes things easier. Even without the fulfillment piece, however, offset is just a lot more cost effective for big print runs. Fulfillment refers to Kickstarter fulfillment. When you create a campaign, it’s encouraged to also offer rewards in addition to the product/intent of your campaign. Ex: a reward could be stickers or branded cups along with the children’s book. Once the campaign is over, Deb would have to send the books and rewards to those 900 people who supported her campaign. Blurb wouldn’t handle that, Deb would.